The green, lion-patterned stain on one of the best World Cups in living memory, the summer of 2014 is but a distant memory for this Cameroon side, now looking in their best shape for about half a decade. Cut loose from their Samuel Eto’o-styled corset, this team has been allowed to breathe again without fear of backlash from their former talisman, and are truly riding the wave of freedom towards Malabo. Topping probably the toughest group of the qualifiers without losing a single game, they were solid and consistent, remaining well-drilled at the back and effective at the front throughout. Conceding just a single goal in six games – coming in a 4-1 win over free-scoring continental giants Ivory Coast – they went about this business in an unflashy, comprehensive manner. Unburdened by a single star player, confidence has been liberally distributed throughout the team, also aided by the widespread revamp which has occurred throughout the squad. Gone are the disinterested and the troublemakers like Benoit Assou-Ekotto, Alex Song and Joel Matip; in are the lesser-known, young and motivated. 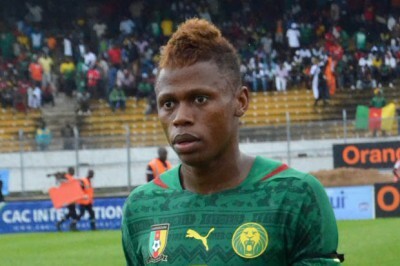 Young forward Clinton N’Jie has been unstoppable, Barcelona youth academy keeper Fabrice Ondoa has been assured, as such entrants compliment what positives remained from the Brazil fiasco. No longer saddled by the negative team atmosphere, Vincent Aboubakar, Eric Choupo-Moting, Nicholas N’Koulou and others have thrived under the responsibility as senior members of the squad, in a transition that has been phenomenally managed by manager Volker Finke. The Indomitable Lions are working their way back to the top of the food chain. Despite the horror show that ensued in South America, Cameroon have remained faithful to their tactical set-up, as they seemingly have managed to recruit the players to allow it to successfully function. Playing a primarily counter-attacking game, they look to their frontline to flood forward with great haste, with the backline holding firm in the face of the opposition’s offence. Whilst in theory is a 4-3-3 formation, the flexibility of the front four can see it morph into a 4-2-2-2, with the foremost central-midfielder joining the Vincent Aboubakar up front – with N’Jie, Choupo-Moting or Benjamin Moukandjo all able to fulfill this role. Confidence – Whilst both the forward and backline can be justified as their main strength, confidence trumps it all at this point. The swing from such a low in Brazil to such a high pre-tournament may mean they are more likely to maintain it in Equatorial Guinea. Consistency is another factor as well – something that Finke must be praised for. There may be more exciting teams to watch in Africa, but the German has drilled this team to produce effective performances, which make up in points accumulation what it lacks in visual thrill. Inexperience – This merry band of youngsters may have got them here, fears must undoubtedly exist at their ability to perform on the big stage. With so many yet to reach double figures in terms of appearances for their country, the know-how of what to do during the big tournaments is priceless, and something Cameroon do lack. Indeed, their failure to qualify for the last two Cup of Nations means that only the likes of captain Stephane Mbia has experience of the competition, creating a lot of pressure on a select few to drag them through. Vincent Aboubakar – Given the role of vice-captain despite being just 22 years of age he is the obvious heir to the Eto’o crown. Whilst game time for his club Porto has been limited, Aboubakar’s 5 goals in 6 games showed how important he is to this team, and should have the supporting cast to grab some goals in Equatorial Guinea. Eric Choupo-Moting – The fellow vice-captain alongside Aboubakar, Choupo-Moting is another to thrive under the responsibility. Continuing his cracking start with Schalke, he plays an understated, hard-working role on the frontline for his country, with the yards covered making up for the relative lack of goals. Volke Finke – Despite the criticism received this summer, Volker Finke has proved himself an astute appointment. A leading light in the revamp of German football in the 90s, the elimination of bad apples from the squad and leading of the consequent transition has won him many admirers. Semi-finalists – Whilst winning the whole thing may be wishful thinking, the great strides made means a semi-final finish is an achievable target for Cameroon, and one that would represent a good return to the tournament after a few years in the wilderness.